Alexa Bliss staked her claim on the Women’s Title on NXT, insulting Bayley and setting herself up as her next challenger. 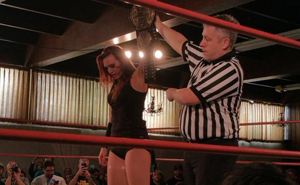 Madison Eagles became a two-time SHIMMER Champion during the taping of SHIMMER volume 77, defeating Nicole Matthews in a No DQ match. Nia Jax was victorious in her debut match on NXT, defeating Evie handedly. Portia Perez announced her retirement at last weekend’s SHIMMER tapings, closing out her career in a massive tag team match that featured the returns of several SHIMMER originals. Summer Rae didn’t take her betrayal lying down, confronting Rusev about his reunion with Lana on Raw and refereeing his loss against Dolph Ziggler on SmackDown.